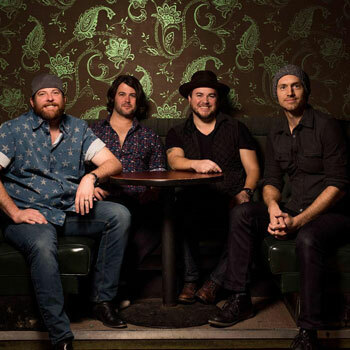 Hot off the heels of their latest single “Love Ain’t,” the ELI YOUNG BAND has always been unique in modern country music – a true band of brothers who play their own instruments, write their own songs and cling fast to their Texas roots. They’d even go so far as to call themselves “misfits,” but with their fourth major label album, FINGERPRINTS (The Valory Music Co.), they’re finally embracing what makes them different once and for all. Although their sound has evolved over time, what they’re good at has always been the same – organic, live-show focused country dripping with authenticity and perfected in clubs, amphitheaters and stadiums from coast to coast. Eli founded the band with guitarist James Young, bassist Jon Jones and drummer Chris Thompson at the University of North Texas in 2000, building a grass-roots fanbase that propelled each of their previous three albums into the Top 5 of Billboard’s Country Albums chart, with 2014’s 10,000 TOWNS bowing at No. 1. Three No. 1 singles gave the band an edgy, romantically-charged identity (“Crazy Girl,” “Even If It Breaks Your Heart” and “Drunk Last Night”). Their stable of hits collected Platinum and Multi-Platinum certifications that lead to Grammy and CMA Award nominations, Billboard Awards and an ACM trophy for Song of the Year (“Crazy Girl”). All of these accolades combined with their loyal fanbase and successful touring have resulted in over 500 million streams of their career catalogue. Confident in their soulful, hearts-on-fire brand of country, the group headed back into the studio to co-produce FINGERPRINTS alongside Ross Copperman and Jeremy Stover. Eight of the 11 new tracks were penned by the band members themselves. They’ve returned to a live-show-first mentality, trading in studio tricks for the “meat and potatoes” of a touring band; ringing guitars, driving bass lines, thundering drums and heartfelt, genuine vocals.